Microsoft says "We haven't yet announced pricing details for Kinect," but retailer GameStop is taking a stab at pricing the new Xbox 360 accessory, putting a $149 USD sticker on pre-orders. The new Xbox 360 bundles may be a better deal. While Kinect by itself may fall under "too much," if you're jumping in for the first time, it's a more attractive $100 investment. 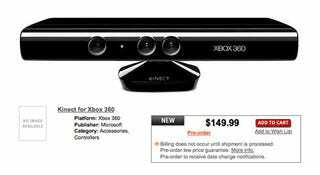 GameStop prices a Kinect Arcade Bundle at $299.99 USD and a Kinect Elite Bundle at $399.99 USD. GameStop also puts a $59.99 USD price on two games, Kinect Adventures! and Kinect Sports.